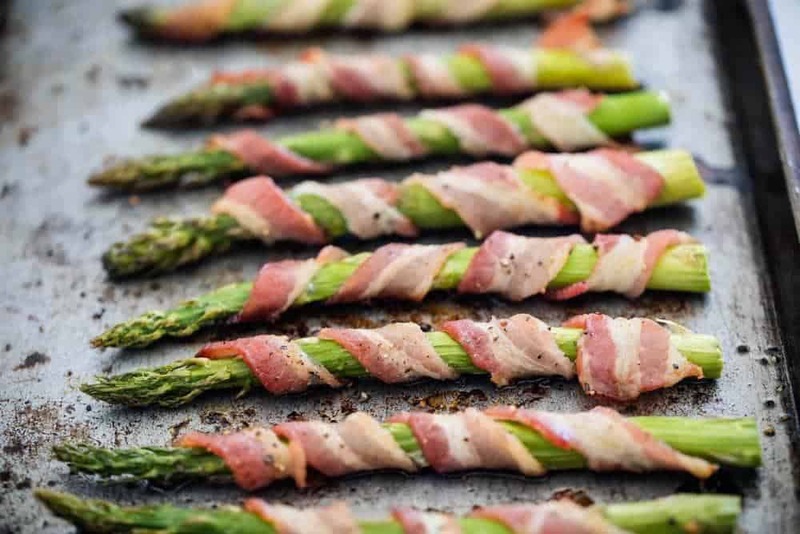 Bacon Wrapped Asparagus – Delicious roasted asparagus wrapped in crispy bacon slices. One of my favorite side dish recipes that pairs perfectly with tons of dishes. And cooked in only 20 minutes, too! 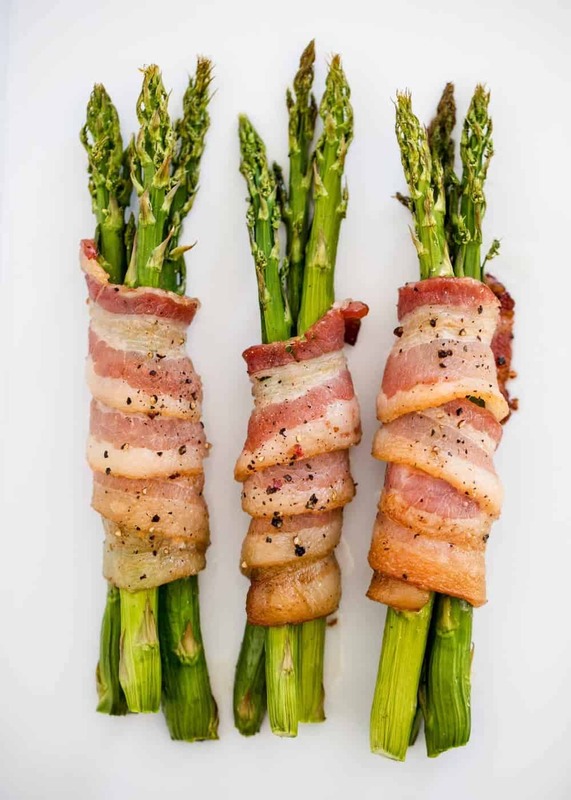 Asparagus wrapped in bacon is one of my top go-to side dish recipes. 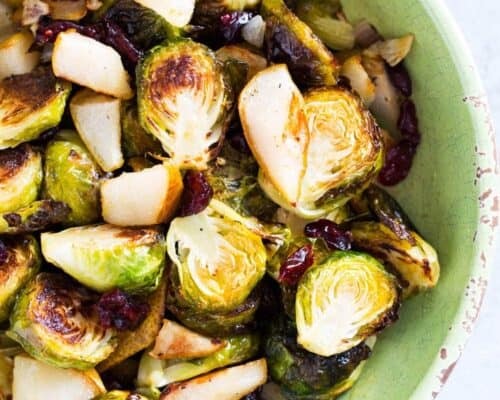 I also love to make brussels sprouts with cranberries and pears, oven roasted vegetables and parmesan broccoli and carrots. 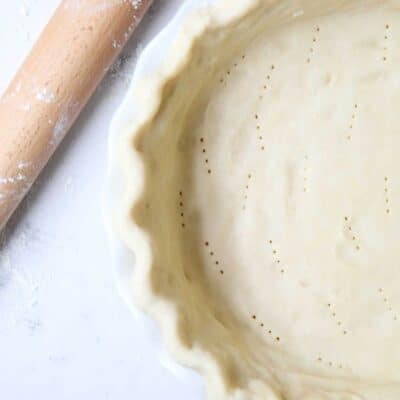 If you’re looking for a new side dish to serve at Thanksgiving or Christmas dinner this year, I have the perfect side dish for you today. It goes perfectly with a spiral ham, turkey, parmesan gnocchi, baked fish …you name it! You could even add on top of this asparagus pasta. These bacon wrapped asparagus are one of my go-to side dishes. 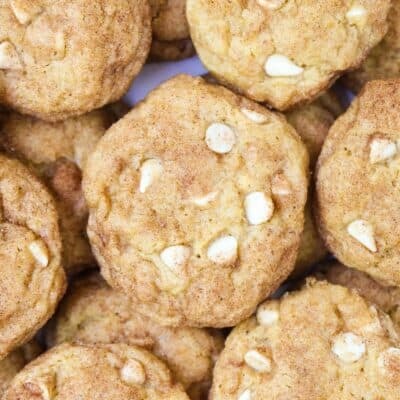 They pair perfectly with just about any dish and are always a crowd pleaser. They look fancy and everyone will be super impressed. 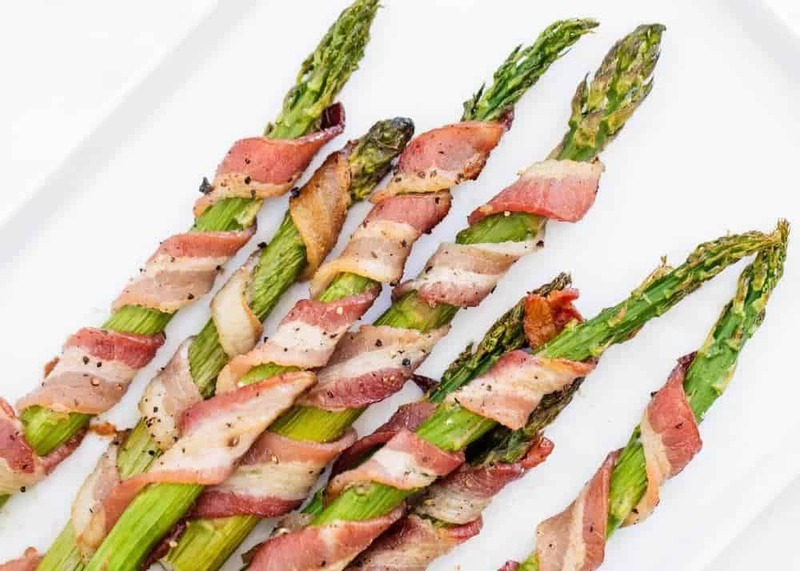 You may even get your kids (or husband) to like asparagus with the added bacon. If you’re looking for more of a traditional recipe, try my oven roasted asparagus. These asparagus can easily be prepared in the oven or on the grill. 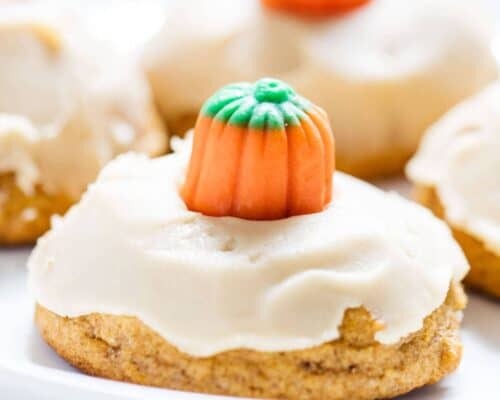 They are so easy to make and only take about 5 minutes of prep work. It’s important to remember to cut the bacon in half and leave room when wrapping it around the asparagus so it has room to cook. Cut the bacon in half, down the middle to create 12 strips. Wrap the bacon around the asparagus spears. Place onto the pan with the bacon ends on the bottom. Salt and pepper. 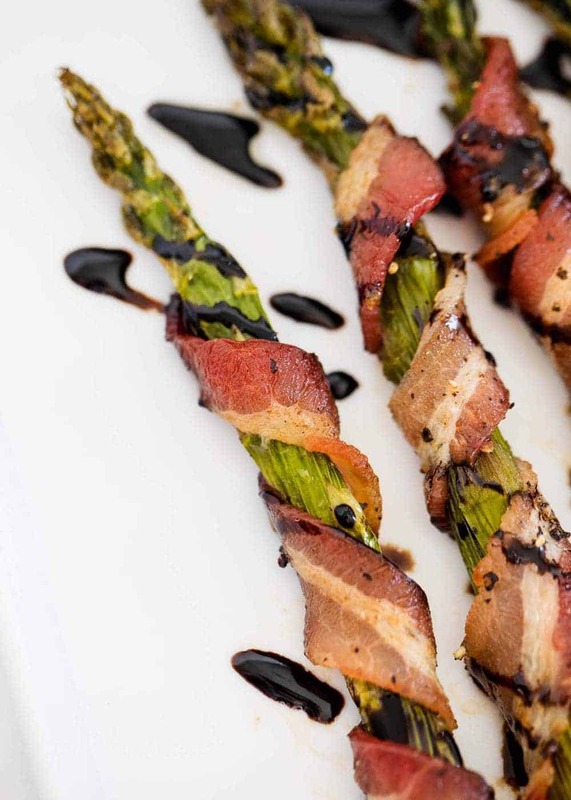 Drizzle balsamic glaze over top asparagus wrapped in bacon before serving. Mix together 2 Tablespoon of balsamic vinegar and 1 Tablespoon of brown sugar and brush onto the bacon before baking. To make the famous bacon wrapped asparagus from Bengal BBQ at Disneyland, cut the asparagus and bacon into 3 pieces. Then wrap each piece of asparagus with bacon and place 5-6 pieces on a skewer. Squeeze a little bit of fresh lemon juice and grill for 5-7 minutes per side, or until crispy. 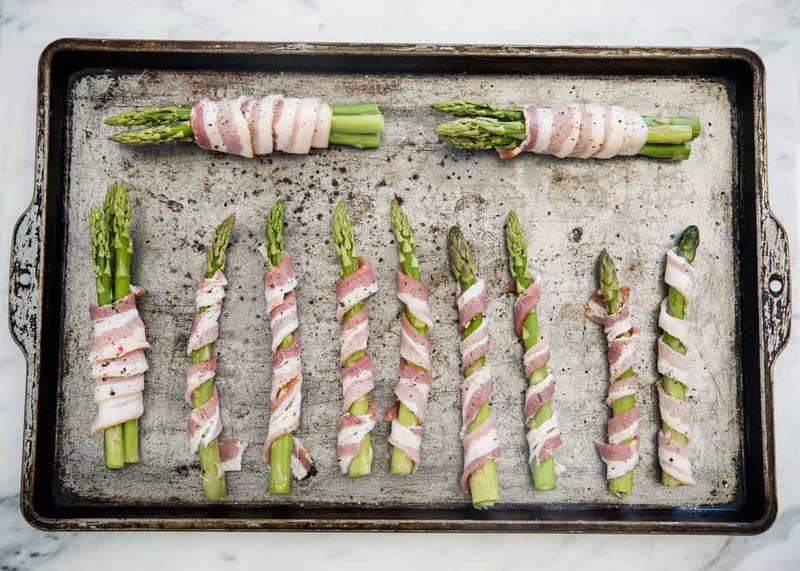 Create a bundle and wrap the bacon around 3-5 asparagus to get in more veggies. Add a sprinkle of parmesan cheese before serving. 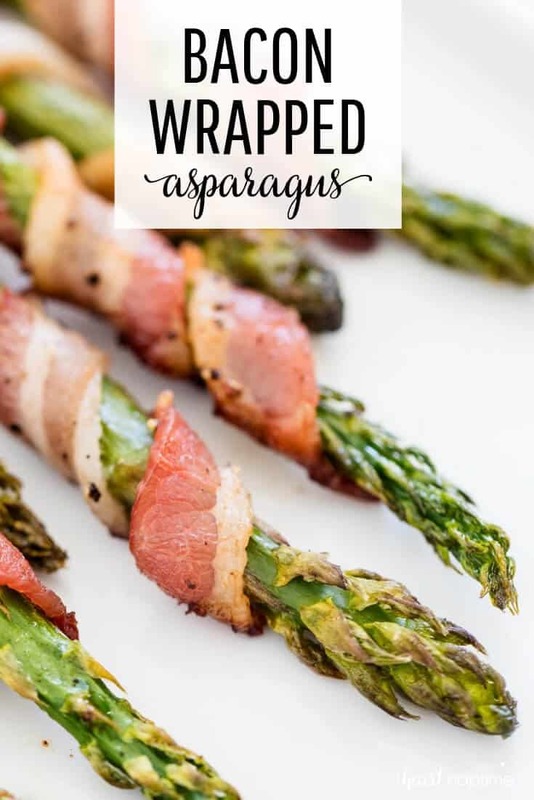 This bacon wrapped asparagus pairs perfectly with so many types of dishes! Whether it’s chicken, fish or pasta, you can’t go wrong serving this bacon asparagus with any of the below recipes! Whole spiral ham or turkey. Chicken recipes such as bruschetta chicken, pizza stuffed chicken breast or balsamic chicken. Alongside pasta such as alfredo, caprese pasta or pesto spaghetti. Bacon Wrapped Asparagus - Delicious roasted asparagus wrapped in crispy bacon slices. One of my favorite side dish recipes that pairs perfectly with tons of dishes. And cooked in only 20 minutes, too! Cut the bacon in half, down the middle to create 12 strips. Then wrap the bacon around the spears. Place onto the pan with the bacon ends on the bottom. Salt and pepper. Drizzle a balsamic glaze over top before serving. Tip: If you use fully cooked bacon (I like the Costco kind), the bacon will get crispier. This is such a great idea! Looks really delicious! 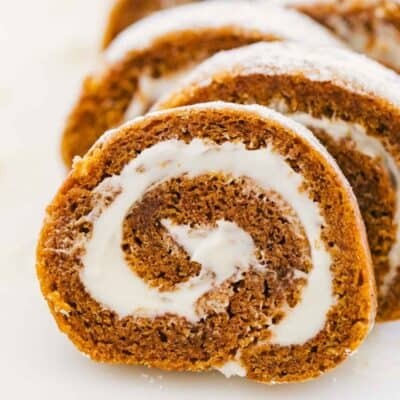 We love this recipe it is so yummy!! I make these every year for our annual christmas party! Love them! Doesn’t bacon make everything better? Glad you enjoyed this meal! What a great way to enjoy asparagus! Everything is better with bacon! 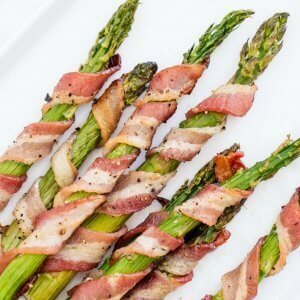 I love asparagus and bacon — this looks like the perfect combination! You are a genius! This is an incredibly beautiful presentation! A simple list of ingredients is what I love. Wow and wow, this is so delicious and it makes my mouth watering. My family doesn’t love asparagus, but maybe if I prepare it like this they will change their mind. It looks delish!